Today, Nintendo's iconic plumber stars in two big RPG series—Paper Mario and Mario & Luigi. But longtime fans will remember that Mario's first experiments with role-playing came through a wonderful collaboration with Squaresoft called Super Mario RPG. Super Mario RPG, released for the SNES way back in 1996, is remembered fondly today not just for giving Mario stats and equipment, but for establishing a funny, charming world filled with quirky characters—the enigmatic doll Geno; the ridiculous creep Booster; the adorably fluffy Mallow. 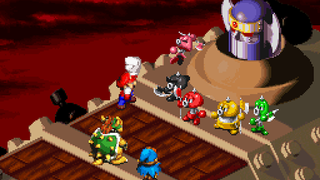 As the first game to blend turn-based combat with button-timed attacks and blocks, Super Mario RPG also established a number of traditions that all Mario RPGs would follow. Last week I had the opportunity to talk to Yoshihiko Maekawa, the Japanese designer who directed Super Mario RPG and now works for a company called AlphaDream, where he works on the Mario & Luigi games. We were mostly talking about the newest Mario & Luigi, which is out on August 11 for 3DS, but I slipped in a question about Super Mario RPG. I told him it was one of my favorite games, and I asked if he has any interest in revisiting that world at any point in the future. "Actually, I don't feel like I want to return to that world and use those characters in another game," Maekawa said through a translator. "I feel like I was able to accomplish what I wanted to with that world and those characters and the gameplay ideas that came out of those, and now I mostly feel like I want to make something different." Alas. Fortunately, Mario & Luigi: Dream Team is excellent—look out next week for both my review and a full account of my chat with the folks at AlphaDream and Nintendo.